Russian President Vladimir Putin called on European Jews facing rising anti-Semitism to return to Russia. “I’ve seen reports that [Jewish] people [in Europe] are afraid of wearing a yarmulke in public. They’re trying to hide their ethnicity,” Putin said. During the meeting, EJC President Moshe Kantor described the “very real exodus of Jews from certain parts” of Western Europe. 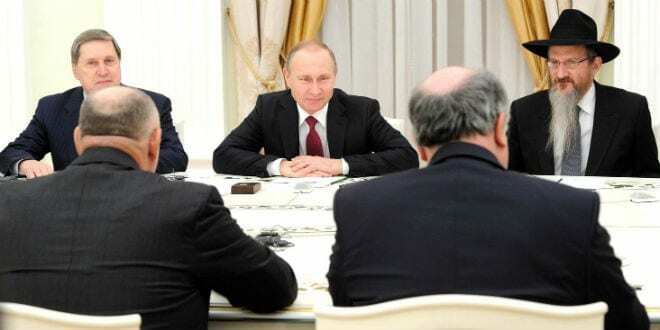 “While Jews were once again a prominent target for global terror during 2015, the attacks in Paris, the U.S., and elsewhere, and the mass murder of Russians on an airline in the Sinai, show that the terrorists target us all,” Kantor said in the meeting. Rising anti-Semitism in Europe has been tied to the Islamic State and Al-Qaeda terrorist organizations, in addition to homegrown extremists inspired by groups like Islamic State. French Jews have been hit particularly hard by Islamic extremism, with a French Jewish leader in Marseilles recently suggesting that Jews should no longer wear yarmulkes in public. At the same time, the EJC commended Russia on the country’s statistical decrease in anti-Semitism in recent years. That is right folks, Putin just like America’s corrupt evil politicians serve his masters biddings well…….